Re ALICE PICKUP, Deceased. The Trustee Act, 1925, s. 27 (as amended). 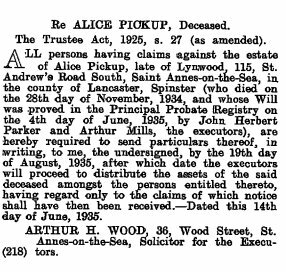 ALL persons having claims against the estate of Alice Pickup, late of Lynwood 115, St. Andrew's Road South, Saint Annes-on-the-Sea, in the county of Lancaster, Spinster (who died on the 28th day of November, 1934, and whose Will was proved in the Principal Probate (Registry on the 4th day of June, 1935, by John HerbertParker and Arthur Mills, the executors), are hereby required to send particulars thereof, in .writing, to me, the undersigned, by the 19th day of August, 1935, after which date the executors will proceed to distribute the assets of the said deceased amongst the persons entitled thereto, having regard only to the claims of which notice shall have then been received.—Dated this 14th day of June, 1935. ARTHUR H. WOOD, 36, Wood Street, St. Annes-on-the-Sea, Solicitor for the Execu- (218) tors.